NOTE: Official stance of this website is that girls are NOT — repeat NOT — yucky. …which, in the decades I’ve been at this, have only actually seen in person a relative handful of times. On the Twitters, I suggested I’ve seen a copy of this comic only about once a decade, and I don’t think that’s too far off. 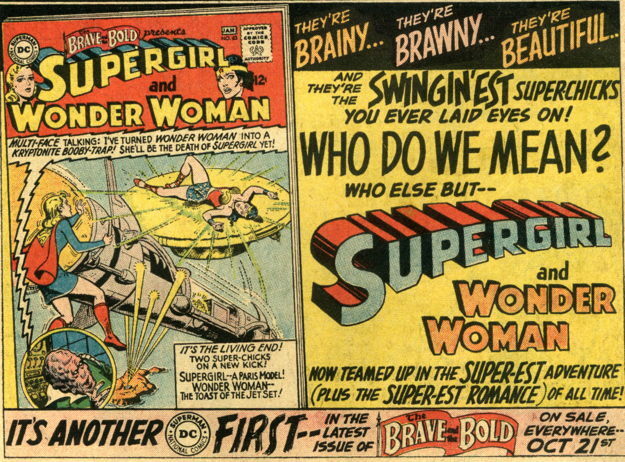 I’ve seen lots of copies of Brave and the Bold issues around it, but not this specific one. Not sure why…just fewer copies out there in the wild, I guess, at least in our general area. I don’t know if people are just holding onto them in their collections, or maybe the actual issue just didn’t sell well at the time. I mean, maybe some (not all…some) young boys looking at the shelves trying to find something to read would pass on the comic that stars a couple of yucky ol’ girls, so is that a reason for reduced availability now? I’m not sure. At any rate, I don’t see this issue very often, but I’ve been wanting to read the darn thing for years, so I took it home to peruse prior to putting it back out for sale. Hey, look, I gets my perks where I can. And, as a professional funnybook handler, I can flip through this periodical without any significant reduction in condition or resale value. …so I’m looking forward to what is almost certainly going to be a whirlwind experience. 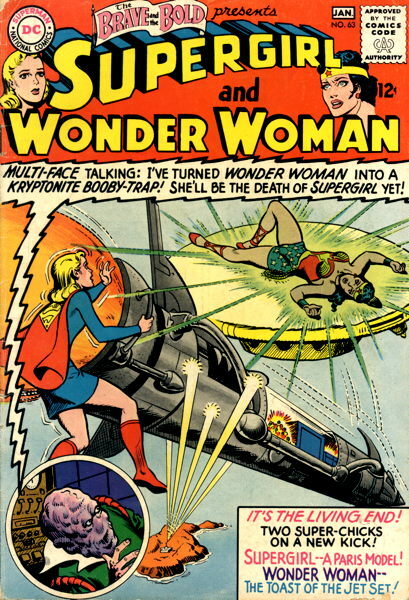 At the very least, let’s look at that cover…I love how huge and eye-catching those logos for Supergirl and Wonder Woman are, even with their disembodied, worried-looking faces hanging out at the edges there. This must have been something else to see brand new on the rack, which that shiny red background behind the logos glaring out at you. 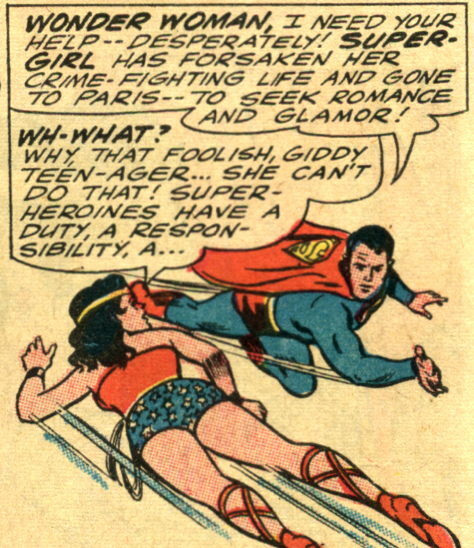 …and boy, did 1960s DC like the word “chicks.” And the phrasing that they’re teamed up in “the super-est romance of all time” — well, “Suffering Sappho!” I guess. Was James Bond really known for being boastful? Sardonic, maybe, but I never thought he was that much of a braggart. 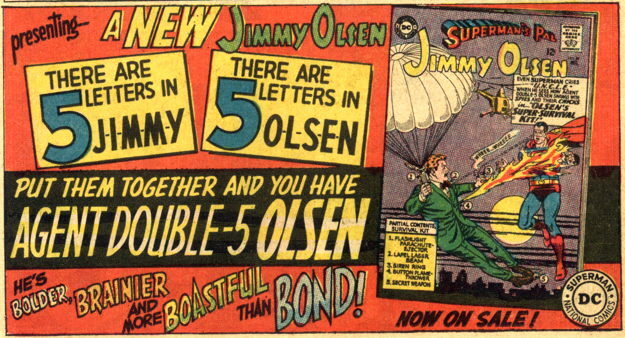 But then it does say Jimmy is more boastful, so I guess Bond doesn’t really have to be so much. 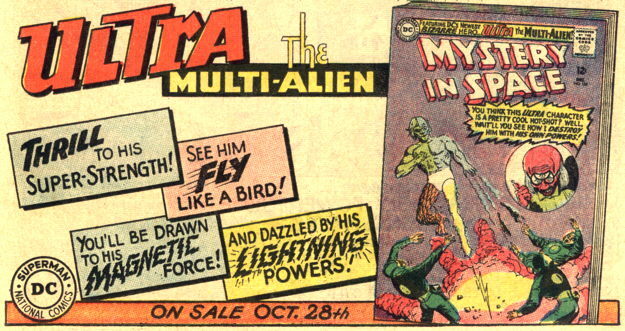 …and well-played on the “you’ll be drawn to his magnetic force!” blurb. 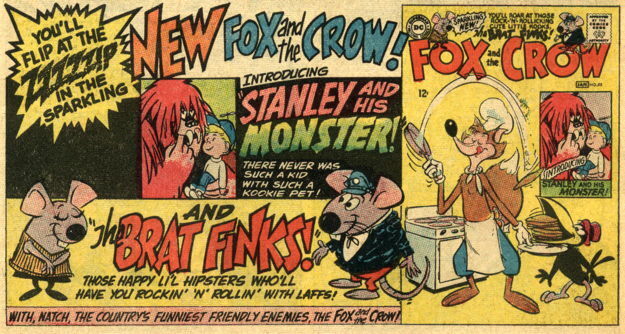 and if you want to learn more about the Brat Finks, why friends, you find yourself on probably the only comics blog in the world with a “brat finks” category you can click on and enjoy. Those house ads are amazingly attractive. I want to read those comics NOW (well maybe not the Fox and Crow, since my pocket money is finite). BTW, note they put the order of attributes as brainy, brawny, and then beautiful. It looks like those issues of B&B before Batman took over have been passed over for reprints. Most interesting thing for me in the ads is what looks like a lettering transition between Ira Schnapp and Gaspar Saladino. The latter always lacked the panache of the former. I think this may be the first time that Supergirl logo was used on a cover? Man, you really have some controversial opinions. Those could get you in trouble someday. I remember Multi-Face from a pair of stories from the great, underrated Millar Superman Adventures run. I had no idea he was an old school villain. I even googled him to check. Wild. If you dig Ultra, you should check out Johns’ Brainiac storyline, you get to see all four alien species in separate, individual forms. David, please tell me more about your loathing of Geoff Johns, which we have in common. Hey David, it’s Action #866-870. Enjoy!